This diagram shows the position of the Earth, in relation to the Sun, at the time of the Winter Solstice, as well as the other solstice and equinoxes of the year, in Earth's Northern Hemisphere. The season of Winter, in the Northern Hemisphere of Earth, begins at the moment of the Winter / December Solstice, Friday Afternoon, 2018 December 21 at 5:23 p.m. Eastern Standard Time (EST) / 22:23 Coordinated Universal Time (UTC). This moment also marks the astronomical beginning of the Summer season in the Southern Hemisphere. Almost 24 hours later, Saturday Afternoon will mark the peak time for the annual Ursid Meteor Shower; of course dark skies are needed to actually see meteors. This meteor shower peaks Saturday Afternoon, 2018 December 22 at 4:00 p.m. EST / 21:00 UTC. In etymology, the word solstice comes from the Latin terms sol (Sun) and sistere (to stand-still). In ancient times, astronomers / astrologers / priests recognized that one day of the year when the Sun would appear to reach its lowest point in the sky for the entire year. The motion of the Sun's apparent path in the sky (what is known astronomically today as the Sun's declination) would cease on this day, and the Sun would appear to stand-still, before reversing direction. With our Gregorian Calendar, this usually occurs on, or very close to, December 21. In ancient times, when people used the Julian Calendar, the Winter Solstice was on, or very close to, December 25, what we now know as Christmas Day. Mid-Winter festivals, at the time of the Winter Solstice, were common in ancient times. Instead of competing with these traditions, the early Roman Catholic Church Christianized the Winter festivals by observing the birth of Jesus Christ on December 25 (the actual birth date of Jesus was probably in September). Today, we know that, while the Sun does have motions, it is actually the motion of the Earth, tilted on its axis 23.44 degrees from the plane of our Solar System while revolving around the Sun, that causes the Earth's seasons. Hence, as the Earth arrives at the point in its orbit around the Sun, where the south polar axis is most directly inclined toward the Sun (thus, the Sun appears at its lowest point for the year in the Northern Hemisphere sky) around December 21, this marks the Winter Solstice in the Northern Hemisphere (and the Summer Solstice in the Southern Hemisphere). Alternately around June 21, the Summer Solstice marks the beginning of Summer in the Northern Hemisphere (and this date also marks the Winter Solstice, which is the beginning of Winter in the Southern Hemisphere) as the Earth reaches the point in its orbit where the north polar axis is most directly inclined toward the Sun. The day of the December Solstice is the only time of the year when the Sun reaches the point of Local Solar Noon at the South Pole. Conversely, it is also the only time of the year when Local Solar Midnight occurs at the North Pole. And, of course, it is the reverse during the June Solstice: the only time the Sun reaches the point of Local Solar Noon at the North Pole and the only time when Local Solar Midnight occurs at the South Pole. Although the Winter months in the Northern Hemisphere are known for the year's coldest weather, the Earth is actually at the point in its orbit closest to the Sun (astronomically known as the point of perihelion) on or very near January 2. The Earth is farthest from the Sun, each year shortly after the Northern Hemisphere's Summer Solstice, on or very near July 5 (the point of aphelion). Solar radiation, and hence heat from the Sun, to warm an Earth hemisphere depends on the length of daylight and the angle of the Sun above the horizon. The tilt of the planet's axis toward the Sun determines the additional and more direct solar radiation received by a planet's northern or southern hemisphere, and hence, the warmer season of the respective hemisphere. The Earth's perihelion in January and aphelion in July is due to the elliptical nature of the Earth's orbit around the Sun. Perihelion and aphelion would not occur if the Earth's orbit was a true circle. Since the Earth is closest to the Sun near the beginning of the Northern Hemisphere's Winter Season, the Earth, then, moves faster in its orbit around the Sun than it moves in July, making the Northern Hemisphere's Winter a shorter season than Summer. Winter will last for only 89 days, while this past-Summer lasted nearly 93 days. This is one of the observed consequences of Johannes Kepler's Laws of Planetary Motion, which he published at the beginning of the 17th century. The day of the Winter Solstice is known as the “shortest day of the year” and the “longest night of the year” as the Sun shines on the Northern Hemisphere for the shortest length of time for the entire year, on this day. For this reason, Homeless Persons' Memorial Day is commemorated on December 21. Interestingly, the climate of a locale in the Southern Hemisphere is, on average, slightly milder than a location at the same latitude in the Northern Hemisphere, because the Southern Hemisphere has significantly more ocean water and much less land. Water warms-up and cools-down more slowly than does land. The only exception is the Antarctic, which is colder than the Northern Hemisphere's Arctic region, possibly because most of the Arctic region is covered with water (although, often frozen water on the surface, but liquid water beneath the ice) while Antarctica is mostly a land mass. Almost 24 hours after the Winter Solstice comes the peak of the annual Ursid Meteor Shower, which actually begins on December 17 and usually lasts about a week ending December 24, 25, or 26. The Ursids seem to comprise a narrow stream of debris originating from Comet Tuttle. Hence, it is difficult to see Ursid meteors outside of a 12-hour window before and after the peak, where possibly 12 meteors per-hour could be seen, under ideal conditions. The Ursid Meteor Shower is so-named because most meteors appear to radiate from a point near the Star Beta Ursae Minoris (apparent meteor shower radiant) in the Constellation Ursa Minor (better known as the asterism the “Little Dipper”), which is the brightest star in the bowl of the Little Dipper. Some people call these meteors “Ursids,” in an attempt to emphasize that their apparent radiant is Ursa Minor, not Ursa Major (the asterism the “Big Dipper”). However, you should not, necessarily, be looking only at the Little Dipper when looking for meteors in this shower. Meteors can appear in any part of the sky at any time (although a meteor's tail may tend to point back toward the radiant). Of course meteor showers, like all celestial observations, are weather-permitting. If there are more than a few clouds in the sky, meteors will be much more difficult to find. Clear skies are not always available in the skies of late Autumn and early Winter. And, it is always best to get away from city lights, for the opportunity to see the smaller, dimmer meteors. As always, the best time to view any meteor shower is between local midnight and local dawn, when the Earth is actually rotating into the stream of meteoric debris. Binoculars and telescopes are not very useful for finding meteors. Meteors streak across the sky in a very short period of time, far too short to aim binoculars or a telescope. So, the best way to view a meteor shower is to lie on a blanket or beach towel on the ground, or use a reclining a chair, outdoors in an area with a good view of the entire sky (with few obstructions such as buildings, trees, or hills), and keep scanning the entire sky. So, if you go out to see the Ursid Meteor Shower, start looking for meteors around local midnight, or perhaps a little later. Make sure you have a good site where you can see most of the sky, and that sky is relatively clear. Be sure to dress properly for the early morning temperatures, now that we are at the very beginning of Winter. In our sky, the Moon lines-up opposite the Sun during the Full Moon phase, both appearing to travel along the Ecliptic, the apparent path on the celestial sphere where we find the major planets of our Solar System as well as the Sun and the Moon. This is due to the fact that all of these major bodies travel within a particular plane of the Solar System. When we view the Moon in our sky, it appears to do the opposite of what the Sun does. When the Sun is high in the sky near the Summer Solstice in June, the Moon is low in the sky. This is because at the Summer Solstice, the North Pole is tilted the maximum extent (23.44 degrees) toward the Sun and away from the Moon. When the Sun is low in the sky near the time of the Winter Solstice in December (when the North Pole is tilted the maximum extent, 23.44 degrees, away from the Sun and toward the Moon), the Northern Hemisphere receives the lowest number of sunlit hours for the year. Then, the Moon is high in the sky and a Full Moon at this time is bright and appears in the sky for the longest length of time for the year. The December Full Moon in the Northern Hemisphere of Earth was known to Native Americans as the Cold Moon or the Long Nights Moon, and sometimes also referred to as the Moon Before Yule. Other names given to the December Full Moon have been reported by the Farmers' Almanac (Oak Moon) and The American Boy's Book of Signs, Signals and Symbols published in 1918 for use by the Boy Scouts (Wolves Moon and Big Moon). Of course Cold Moon refers to the cold temperatures that begin with the start of the Winter season this month. And, the Moon Before Yule was used by the Christian settlers to refer to the Full Moon before Christmas Day (Yule being an early religious festival observed by Germanic peoples, later absorbed and equated with Christmas); of course, this name would not be used during years when the December Full Moon is after Christmas Day. With the longest night of the year occurring near the Winter Solstice, this justifies the term Long Nights Moon, as the Full Moon is visible all-night long, rising approximately at sunset and setting approximately at sunrise. And, this month's Moon is high in the Northern Hemisphere sky, as this is the time of the year that the Sun is the lowest in the sky; traveling high in the sky also means the Moon stays in the sky longer. A couple centuries ago, when night artificial lighting had little effect and the December Full Moon brightened a snowy field, one might see how some people may refer to this as a Big Moon. In the Southern Hemisphere, the December Full Moon is known as the Strawberry Moon, Honey Moon, and Rose Moon. Special Thanks: Eric G. Canali, former Floor Operations Manager of Pittsburgh's original Buhl Planetarium and Institute of Popular Science and Founder of the South Hills Backyard Astronomers amateur astronomy club. Image of the Unit Telescope 4 (UT4) of the European Southern Observatory's Paranal Observatory in the Atacama Desert of northern Chile. This was the first observatory to use multiple lasers to be the most powerful laser guide stars ever used in astronomy. Now, two space researchers propose using a mega-watt laser, through a large telescope, to signal possible astronomers in other star systems. Could a high-power laser, focused through a telescope, attract the attention of astronomers in distant star systems? Two scientists at the Massachusetts Institute of Technology (MIT) think so. A paper published in the Astrophysical Journal by MIT scientists James Clark and Dr. Kerri Cahoy proposes that a 1 or 2 mega-watt laser, focused into Outer Space using a 30-to-45-meter telescope, could be enough to signal astronomers as far away as 20,000 light-years! The idea is that such a strong laser-light would produce a beam of infrared radiation strong enough to stand-out next to the bright light coming from our local star, the Sun. So, if alien astronomers happened to use their telescopes to look toward our Solar System, they would notice an unusually bright light in addition to the light from our Sun. Of course, this type of communication would only be practical for short distances. If the astronomers were as far as 20,000 light-years away, they would not receive the signal until 20,000 years in the future. And, if they would immediately return such a signal to us, it would take 40,000 years for us to receive the reply! The first problem with making such a planetary beacon a reality is building lasers and telescopes to the large size requirements necessary. The U.S. Air Force's Airborne Laser, which has been tested as a way to shoot-down ballistic missiles from a military jet, is one example of a laser which could be strong enough for a planetary beacon. Although no telescope is currently large enough for such a planetary beacon, 24-meter and 39-meter telescopes now under construction in Chile may be large enough for such a project. The Large Magellan Telescope (24-meter) is being built by a consortium of countries led by the United States, and the European Extremely Large Telescope (39-meter) is being built by the European Southern Observatory. Do extra-terrestrial astronomers, now, have such a planetary beacon which we could find? The MIT scientists determined that a 1-meter telescope on Earth could distinguish such a beacon. But to find it, the telescope would probably have to look directly at the beacon. "Megawatt-Class Lasers from Earth Could Attract Alien Astronomers, Says New Study." "Astronomical Calendar: 2018 November." 2018 Nov. 1. Mars map of landing zone target for the Mars InSight Lander, plus other NASA probe landing sites. On Monday Afternoon (November 26), the latest NASA space probe to the Planet Mars, called 'InSight' (Interior Exploration using Seismic Investigations, Geodesy and Heat Transport), is expected to land on the Red Planet. NASA will provide several ways to follow the landing on-line. Launched on May 5, InSight will be the first new NASA spacecraft to land on Mars since 2012, when the Curiosity Rover landed. Officially, InSight's mission will last two years; but if other NASA missions to Mars are any indication, it may last much longer. Seismometer to record 'Mars-quakes' as well as meteor impacts. As the only seismometer on Mars, it includes additional sensors measuring weather readings such as wind speed and barometric pressure, which could be misinterpreted as a Mars-quake. Eventually, after gathering seismic data, scientists hope to be able to map geologic layers within Mars, perhaps including water. A pair of precise radio transmitters, by bouncing radio signals between Earth and Mars, will help scientists identify the exact location of InSight on the surface of Mars. And, as Mars rotates, scientists will be able to measure the tiny wobbles, that could help determine the planet's interior structure—particularly whether the planetary core is solid or partially liquid. A heat probe, which will be hammered 16 feet / 5 meters into the Martian surface (much deeper than the mere inches of previous planetary probes) will measure how heat is rising through the planet. It will also produce its own brief flashes of heat, to study how the heat flows through the Martian rocks which surround the InSight landing site. Launched along with InSight on May 5 were two separate 'cube-sats' known as the Mars Cube One mission, which NASA hopes will be able to document the landing of InSight. Mars Cube One is an experimental demonstration mission consisting of two nano-spacecraft. Each known as a 'cube-sat,' titled as such as the first ones were launched as 'sats' or satellites of the Earth, the two nano-spacecraft will actually fly-by Mars without going into orbit of the Red Planet (although, eventually, these two nano-spacecraft may go into orbit around the Sun, but far away from the Sun). No earlier than 8:35 p.m. EST / Nov. 27, 1:35 UTC - Confirmation from InSight via NASA's Mars Odyssey Orbiter that InSight's solar arrays have deployed. "NASA InSight Space Lander on Way to Mars." Monday, 2018 May 7. 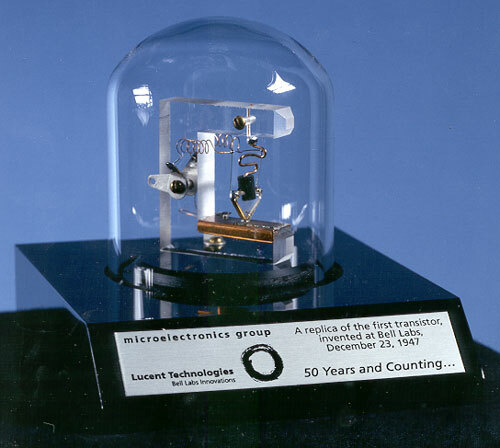 The transistor, the workhorse of the electronics and space ages, may be ready for a technological upgrade, which could greatly improve computers and portable telephones. According to Purdue University Assistant Professor Tillmann Kubis, the combination of quantum cascade laser and transistor technologies could help manufacturers make even faster, more efficient, and smaller transistors. One of the greatest inventions of the 20th century, the transistor is a key active component in nearly all modern electronics. Without the much reduced size and weight of transistors, it would have been much more difficult (perhaps not even possible) to, literally, launch payloads, including humans, into Outer Space. Circuits in a wide variety of electronic and digital devices use transistors as electronic switches: “on” or “off” state – a binary computer system's “ones” and “zeros” determined by the flow of electrical current or the lack of flow of electrical current (actually, a lesser electrical current due to a lower voltage). The quantum cascade laser technology will be able to offer better switching behavior for computers and other digital devices, compared to traditional transistors. Smaller transistors, that operate at lower power and lower temperatures, are the major advantages of the new technology. The new technology becomes more sensitive to a switching operation. Quantum cascade lasers can reduce the system noise, from the heating-up by electronics, to more easily detect the difference between the “ones” and “zeros” of such switches. The quantum cascade laser allows electrons to cascade to eventually become photons. The photons become the laser switch, which then operates at the same time as a conventional transistor switch, to better complete the operation. Professor Kubis says that the discovery of the usefulness of the combination of quantum cascade laser technology with conventional transistor technology occurred by accident at the beginning of the year. He said this accidental discovery happened during his lab's work and modeling of transistors in-general. The Purdue University researchers also consider this type of new transistor as a promising candidate for next-generation nano-devices. Professor Kubis says that this discovery is an advance for other nano-transistor technologies being developed. Purdue University News Release - "Transistor technology may improve speed, battery life for computers, mobile phones and other electronics." Laser RetroReflector on the top deck of the Mars InSight space lander, for laser range-finding from Martian orbit and future node in a proposed Mars geophysical network. Mars InSight is expected to land on Mars on November 26. "Astronomical Calendar: 2018 October." 2018 Oct. 1. Artifacts from the historic space mission of Apollo 11, which took two American astronauts to the surface of the Moon for the first time in 1969, are now on display at the Senator John Heinz History Center in Pittsburgh. This temporary exhibit, titled “Destination Moon: The Apollo 11 Mission,” which features more than a hundred artifacts from the Smithsonian Institution's National Air and Space Museum, will be on display at the Pittsburgh museum through Monday, 2019 February 18. On 1961 May 25 before a joint session of the U.S. Congress, U.S. President John F. Kennedy set a goal, for the fledgling National Aeronautics and Space Administration (NASA): "I believe that this nation should commit itself to achieving the goal, before this decade is out, of landing a man on the Moon and returning him safely to the Earth." 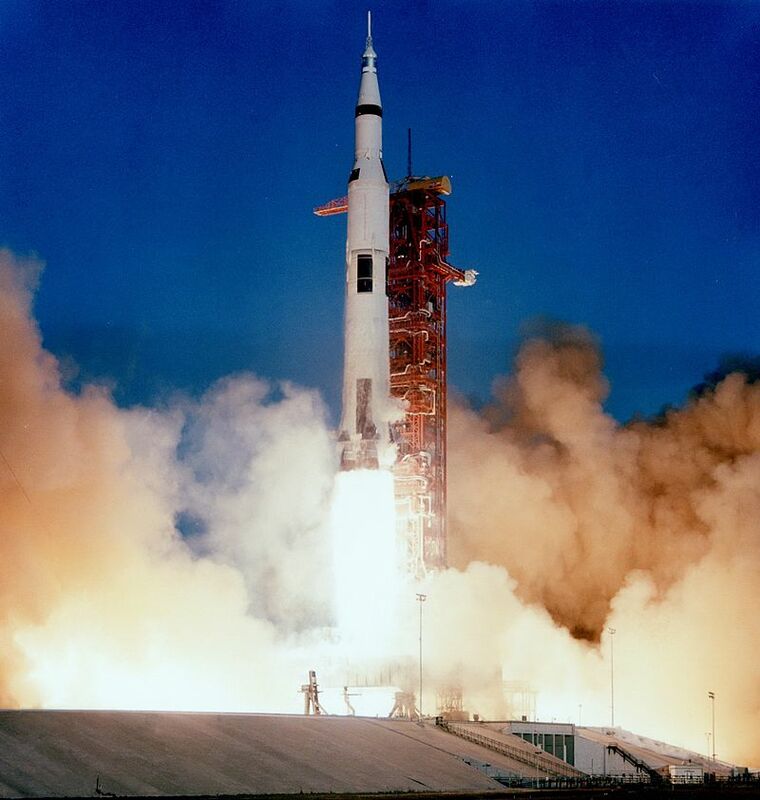 After a decade-long “Space Race” with Russia, which included the loss of three astronauts in a space capsule fire during a test before the launch of Apollo 1 in 1967, this goal was achieved when Neil Armstrong stepped on the lunar surface on Sunday Evening, 1969 July 20 at 10:56:20 p.m. Eastern Daylight Saving Time (EDT) / Monday (“Moonday”), July 21, 3:56:20 Coordinated Universal Time (UTC). Known as the “nation's attic,” the Smithsonian Institution acquired and displayed many artifacts from our nation's Space Program in the National Air and Space Museum on the National Mall in Downtown Washington DC. At the present time, the National Air and Space Museum is undergoing a rehabilitation which includes a new “Destination Moon” permanent gallery expected to open in 2022. However, the National Air and Space Museum is still in preparation for the celebration of the 50th anniversary of the first landing of humans on the Moon next year. 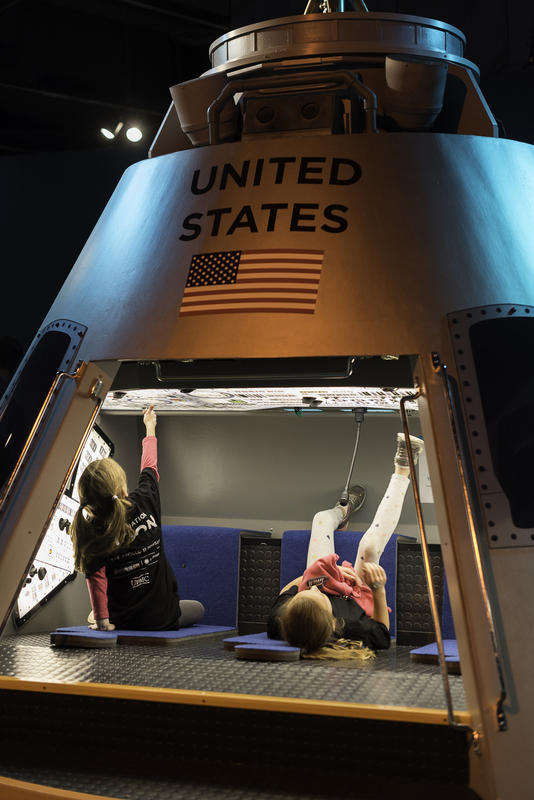 During the rehabilitation, the Smithsonian is providing some Apollo 11 artifacts for a traveling exhibit, which is visiting museums in four American cities during a two-year (2017 to 2019) national tour (the first national tour since 1970 to 1971). The Senator John Heinz History Center (an affiliate of the Smithsonian Institution) is the third of the four museums being visited, and the only museum to be visited in the eastern part of the United States. Previously, the exhibit was displayed at Space Center Houston and at the Saint Louis Science Center. After the Pittsburgh run, this exhibition will be displayed at The Museum of Flight in Seattle (2019 April 13 to September 2). Sometimes Andrew Masich, Senator John Heinz History Center President and Chief Executive Officer, can be found explaining parts of the exhibit to visitors. On the day this writer visited the exhibit, Mr. Masich was in the exhibit hall telling some visitors the story of how Apollo 11 astronaut Buzz Aldrin had to use his felt-tipped pen to launch the Lunar Excursion Module (LEM) from the Moon to meet the Command Module in Lunar orbit, for the return trip to Earth. The circuit-breaker switch, which should have been used to launch the LEM, had earlier broken-off from the control panel after Mr. Aldrin had inadvertently bumped the switch and knocked it on the floor, when he turned-around in the very tight quarters of the LEM. The Senator John Heinz History Center (named for the late U.S. Senator H. John Heinz III, who died in a mid-air collision near Philadelphia in 1991) is open each day from 10:00 a.m. to 5:00 p.m. Eastern Time (closed on New Year’s Day, Easter, Thanksgiving, and Christmas). The largest history museum in Pennsylvania is located at the northeastern end of Downtown Pittsburgh's Golden Triangle, in the Strip District at the corner of Smallman Street and 13th Street. About a mile away, across the Allegheny River on the Lower North Side, is the original Buhl Planetarium and Institute of Popular Science. Today (October 24) marks the 79th anniversary of the dedication of Buhl Planetarium. "170th Anniversary: Smithsonian Institution." 2016 Aug. 10. "Apollo 11 TV Camera Developer Dies at 91." 2015 Feb. 23. "JFK: Loss of the Man Who Sent Us to the Moon." 2013 Nov. 22. "Moon Day - A National Holiday ?" 2013 July 20.